The MiLBYs are the end-of-season awards that honor the best players, teams and performances of the Minor League season. For three weeks, fans chose their favorites in 13 categories, and now we're announcing the Fans' Choice winners as well as MiLB.com staff picks for the major awards. A ninth-round pick out of Purdue, Nick Wittgren was the 132nd pitcher -- and fourth by the Marlins alone -- selected in the 2012 Draft. Very few of them have proven as dominant in their brief professional careers as the 22-year-old right-hander, who owns a 0.91 ERA in 75 games. 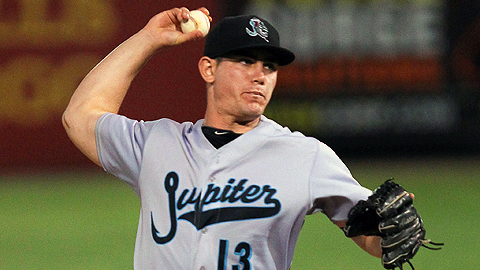 Wittgren is MiLB.com's selection for the 2013 Relief Pitcher of the Year MiLBY after going 2-1 with a 0.77 ERA in 52 appearances for Class A Advanced Jupiter and Double-A Jacksonville. His 26 saves (in 30 opportunities) were 10th-most in the Minor Leagues. Of the nine hurlers with more saves, only Jake Barrett (D-backs) posted an ERA (at 1.21) within a run of Wittgren's. Wittgren struck out 63, walked 10 and allowed one home run in 58 1/3 innings for a 0.891 WHIP and a .198 batting average against. Wittgren lacks an overwhelming upper-90s heater but has masterful command of his 92-93 mph fastball and a good hard curve that he can throw in any count. Though Wittgren is Purdue University's all-time saves leader and has been outstanding in the closer role thus far as a pro, MLB.com's Jonathan Mayo suggests he's more likely to serve as an ace setup man in the Majors. In the meantime, Wittgren continues to excel in the elite Arizona Fall League, where he's allowed two singles while fanning nine of the first 15 batters he's faced in 4 1/3 scoreless innings for the Glendale Desert Dogs. Most relievers used to be starters, and Wittgren is no exception. He was a starter in his freshman year at Parkland College in Champaign, Ill., going 10-0 with a 4.30 ERA in 13 appearances. Having been accepted at Purdue for his sophomore year, Wittgren underwent ulnar nerve transfer surgery on his throwing arm in summer 2010. "I wasn't able to pitch full out until late December or early January, so Coach [Doug] Schreiber put me in the bullpen," Wittgren said. It worked out well, as Wittgren was named to the Second Team All-Big Ten squad after leading the conference with 12 saves. "The next year, Coach asked me if I wanted to go back to starting and I said no, I loved closing. He said, 'That's what I was hoping you'd say.'" Wittgren saved 10 more games in 2012 before entering the pro ranks with the Marlins that summer. He was the third of seven Boilermakers taken in the 2012 Draft, behind catcher Kevin Plawecki (first round, Mets) and Cameron Perkins (sixth round, Phillies). All three of them spent time in the Florida State League this season. Wittgren didn't face Plawecki, his former batterymate, but he did have a run-in with Perkins. "[Perkins] had just missed a month with a broken arm after he was hit by a pitch, and we [the Hammerheads] played in Clearwater soon after he got back," Wittgren said. "It was a close game and I was trying to pitch him in, and I hit him. In the arm. We laughed about it later, but he kind of gave me a look like, 'Come on!'" Another moment Wittgren clearly remembers from the regular season came six days earlier when he allowed his only homer as a pro. "A few of my friends were in Daytona that day, so they came to the game -- and of course it would be the game I gave up a homer," he said. "We had a pretty big lead, so when I went into the game in the ninth, my coach said, 'Just throw fastballs -- down and away.' The first guy up was a lefty [switch-hitter Zeke DeVoss] and the first pitch was a ball outside. I came back with a second one and he poked it out to left." In Wittgren's defense, there was a 14-mph wind blowing out to left that day. Apart from plunking friends and allowing one homer, Wittgren was utterly dominant for long stretches of the season. In May, he did not allow a run in 13 2/3 innings over 11 appearances, converting all eight of his save opportunities. He finished up his first full season with nine scoreless appearances for Jupiter in August (9 IP, 0 R, 4 H, 1 BB, 10 K), then jumped to Jacksonville, where he didn't surrender a run, a hit or a walk in four one-inning Double-A stints. Along with his fastball and curve, Wittgren has been working on a changeup that he says he's finally getting a good feel for. "There's quite a difference between pitching in Florida and being out here in Arizona [for the AFL]," he said. "It's so dry that I don't feel like I can get a firm grip sometimes, but things are going well so far." Marlins director of player development Brian Chattin says the club is excited about Wittgren's progress. "We'd heard good things about him in our Draft preparations and felt he could establish himself in the bullpen and move up relatively quickly," he said. "He's certainly exceeded expectations, and he's worked really hard on his changeup -- it's always good to have a third pitch in your back pocket when you're facing advanced hitters. "He's one of those players who really gets the most out of his talent. It's difficult to project at this point, but we think he can pitch in the back end of a big league bullpen." Commentators sometimes talk about a "closer mentality" and how it cuts both ways -- some pitchers struggle with the pressure of a save situation while some closers struggle without it in non-save situations. Wittgren says he's always the same pitcher. "I always try to pitch like it's a one-run ballgame -- I think you need to have that mentality of going right after hitters and trying to put them away." It's a mentality that made him our choice for Minor League Reliever of the Year.